How to Train Your Dragon: The Hidden World DVD 2019 (Pre-Order) Shipping 5/21/19. Condition is Brand New. Shipped with USPS First Class Package. Title: How To Train Your Dragon 1 And 2. Format: DVD. Region: DVD: 1 (US, Canada.). Are accepted. MOVIES ARE RENTAL EDITION. Trending at $4.38eBay determines this price through a machine learned model of the product's sale prices within the last 90 days. Title: How To Train Your Dragon: The Short Film Collection. Format: DVD. Region: DVD: 1 (US, Canada.). 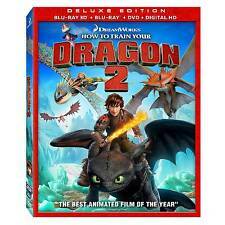 How To Train Your Dragon 1 2 BLU-RAY 2-movie 2-disc sets and DIGITAL Copies. Condition is Like New. Shipped with USPS First Class Package. HOW TO TRAIN YOUR DRAGON 1 & 2 ~ DVD New Factory Sealed w/Slip-Cover. How to Train Your Dragon 2 ( 3D Blu-ray Disc Only in Replacement Case). Condition is Very Good. Shipped with USPS First Class Package. Trending at $9.49eBay determines this price through a machine learned model of the product's sale prices within the last 90 days. This is How to train your Dragon 4k UHD Blu ray! This is Like New. No scratches on the disc. You will receive the 4k disc, Blu Ray, Case, artwork and slip cover in great condition. Picture provided is the actual item you will receive. No Digital Copy included. Please feel free to ask any questions. I have great feedback, so bid with confidence. I accept PayPal and will ship the next business day after payment is received. I also ask that payment be received within 3 days of auction closing unless you contact me. Thank you for looking and Happy Bidding! Title : How to Train Your Dragon. Condition : Used - Good. The item also includes the original artwork. It’s a warehouse. We barely enjoy coming here, but for you, we will. (new but digital copy may not work because its ex). 2011 HOW TO TRAIN YOUR DRAGON 3D / 2D BLU-RAY + DVD 2-DISC SET BRAND NEW SEALED! HOW TO TRAIN YOUR DRAGON 3D BLU-RAY & DVD 2 disc set from 2011. The blu-ray contains BOTH the 3D & 2D versions of the film. cents withNO RESERVE no matter how rare or expensive -NO ridiculous. 5 out of 5 stars - 2011 HOW TO TRAIN YOUR DRAGON 3D / 2D BLU-RAY + DVD 2-DISC SET BRAND NEW SEALED! 14 product ratings14 product ratings - 2011 HOW TO TRAIN YOUR DRAGON 3D / 2D BLU-RAY + DVD 2-DISC SET BRAND NEW SEALED! How to Train Your Dragon (Blu-ray/DVD) Theres issues with watching in 3d, otherwise is good. 4K Ultra HD Requires 4K Ultra Player/Supported Tvs to play! Will not work on Standard Blu-Ray Players/TVs! " How To Train Your Dragon The Hidden World "4K Ultra HD Blu-Ray Digital. 4K Ultra HD Disc Blu-Ray Disc Digital Copy! Contains 2 Discs: Blu-ray & DVD discs along with a bonus disc with 2 exclusive featurettes. 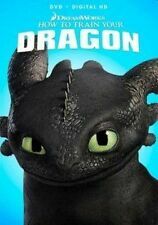 How to Train Your Dragon samsung promotional copy. 3D disc has been viewed only twice. HOW TO TRAIN YOUR DRAGON 2 FYC DVD. Here is your chance to get a really great and rare DVD! It's a must for any Movie Lover! Title: Dragons: Race To The Edge - Seasons 3 And 4. The high stakes continue as the riders advance in their hunt for Viggo, Ryker and their expanded Dragon Hunter army. Tune in as the riders discover that Viggo has a Dragon Eye, a dragon fortress, and sinister plans which include putting a pricey bounty on Hiccup's head. Title: How To Train Your Dragon 2. Format: DVD. Region: DVD: 1 (US, Canada.). Original Language: ENG. Distributor/Studio: Dreamworks Animated New Artwork. 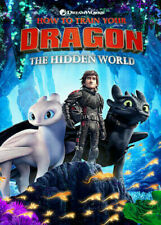 HOW TO TRAIN YOUR DRAGON - THE HIDDEN WORLD 3D Blu-ray One Disc - Region Free. Only compatible with Blu-ray 3D Player. ONLY INCLUDES THE 3D BLU-RAY DISC AND THE CASE. THIS DVD HAS NEVER BEEN USED. 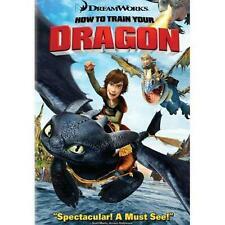 How To Train Your Dragon: The Short Film Collection [New DVD]. Condition is Brand New. Shipped with USPS First Class Package. THIS MOVIE WILL BE OPEN! (TO REMOVE DVD AND DIGITAL). THIS IS A BLU-RAY ONLY. NO DVD OR DIGITAL. (4K ULTRA HD BLU-RAY DIGITAL HD, 2018). How to Train Your. Smoke Free. Factory Sealed. 100% Authentic. How to Train Your Dragon (Blu-ray Disc, 2011). Condition is Very Good. Shipped with USPS First Class Package. How to Train Your Dragon 1&2. The discs are preowned but have been tested and are in good condition. Preowned/Great Condition/No Digital Copy. Also Available for Local Pick-Up. Cell Phones: We are not able to verify if a particular phone will work with your service provider or in any particular foreign country. Region 1 DVD (US & Canada). The disc or discs have been buffed as needed. Item is in good shape with some slight wear or damage present. Insert may be missing. Zone 1 compatible. Case may have minor damage, such as a small crack. All items packed in bubble mailers and do not include an invoice or receipt in package. All photographs are stock photographs and may differ slightly from actual items sold. We are Goodwill North Central Wisconsin. Ships from our location within 1-2 business days (business days Monday - Friday) from USA. All items guaranteed. How to Train Your Dragon: The Short Film Collection (4 short movie DVD set). Condition is Brand New. Shipped with USPS First Class Package. These are brand new in their wrappings. I had purchased these for favors for my son’s birthday party and ended up with a few extras. Please message me if you want to combine shipping. Condition: Very Good. ISBN/UPC: 097360824841. You are looking at a NEW DVD. We will correct any problem you may have. If you are not satisfied we will do what it takes to make it right. We will correct any problem you may have. If If you are not satisfied we will do what it takes to make it right. 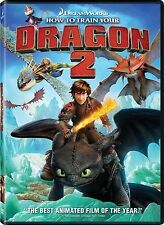 How to Train Your Dragon 2 [DVD] - CD EKVG. Condition is Very Good. Shipped with USPS First Class Package. We will correct any problem you may have. If If you are not satisfied we will do what it takes to make it right. Be advised all software is region coded and will work on. ITEM INFORMATION. How to Train Your Dragon 4K Ultra HD Blu-ray Digital (SLIPCOVER). Includes 4K UHD, Blu-ray and a digital copy of How to Train Your Dragon (Subject to expiration. Includes 4K UHD, Blu-ray and a digital copy of How to Train Your Dragon 2 (Subject to expiration. ).